Compare Samsung S6 Vs IPhone 6s - Which Flagship is Best? Compare Samsung S6 Vs IPhone 6s – Which Flagship is Best? Samsung S6 Vs IPhone 6s: Welcome to the biggest smartphone battle of the year 2015. In the red corner, we have Samsung S6 while in the blue corner we have Apple IPhone 6s. Whether you like these phones or hate them, these two smartphones have become one of the bestselling smartphones on their respective platforms. Both have come up with massive changes as compared to their predecessors. So out of the two phones – which should you go for? Let us see who wins at what point in the battle. 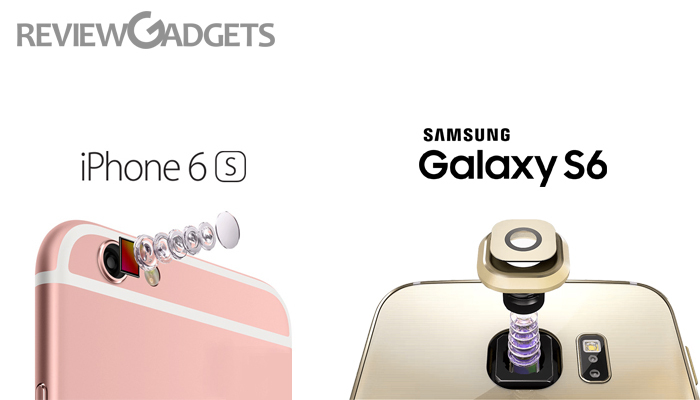 Battle Begins Compare Apple Iphone 6S VS Samsung Galaxy S6 – Which one is Best and Which one is not? Design: With sleek changes in Samsung A6, the Korean based company has released S6 with design similar to that of IPhone 6S. However, this change is also good in some aspects as now both the smartphones give the feel of being premium and that is exactly what they are. To achieve this premium status both the smartphones had to make significant sacrifices. While Apple IPhone 6s has become a bit heavier with the introduction of 3-D touch, Samsung has ditched its removable battery and expandable memory for a more premium outlook. While Apple has gone a step further to ensure the strength of its device, by utilizing Aluminium 7000, Samsung has kept it low by utilizing Aluminium 6000. Aluminium 7000 is 60 percent stronger than its predecessor i.e. Aluminium 6000 and lighter by the same amount. Concerning looks and appearance Samsung has an edge with its shimmery glass back and metallic frame, however, practically this design might bring it on the back foot. The glass back makes it a bit difficult to hold in hand. If we talk about the day to day usage, then Apple clearly has an edge with its metal back and added strength. Galaxy S6, however, is a bit slippery and hence do not think about laying it on a slightly angled surface. Screen: If we talk about the screen size, then IPhone 6S has a screen size of 4.7 inches whereas Samsung S6 flaunts a greater screen size of 6.1 inches. IPhone 6s has been perfectly sized for a single-handed usage, and there have been no improvements in its display as compared to IPhone 6. It still possesses a display of 1334X750 which is just as sharp and vivid. However, there have been certain changes as far as the functionality is concerned. IPhone 6s comes with a 3-D touch technology, which provides an extra layer of depth in inputs. Samsung, on the other hand, did not come up with this pressure sensing technology but has a much vivid and sharp display as compared to IPhone 6. It possesses Super AMOLE technology that tends to provide more vibrant colors and higher contrast ratios. Performance: Apple in the past had come up with A8 CPU, which blew away the competition for single-core Android smartphones, this time, it has come up with A9 chip which is faster than its predecessor. Samsung in reply has come up with its Exynos octa-core chip which is relatively very much closer to the A8 chip utilised in the Apple IPhone 6s. So, where does Apple A9 stand? Now, to our as well as your surprise, Apple A9 is relatively 70 per cent faster than A8 on CPU front while 90 per cent on the GPU front. Things tend to take a new direction when we compare the two devices based on the RAM they provide. While the Apple has offered 2 GB RAM, Samsung has been a bit generous and released its new smartphone with 3 GB of RAM. Regarding figures, it might appear as if Samsung is on the leading edge. However, it is widely known that IOS puts less pressure on the RAM as compared to Android. If compared regarding percentage, Android puts as much as 2 times pressure on the RAM. IPhone 6 feels faster than S6; however, we don’t have any negative feelings about the Samsung S6 either. Camera: Apple was holding the smartphone camera market until now. However, with some improvements in its Camera features, Samsung has apparently entered the competition. Apple IPhone 6S has seen a jump concerning its megapixels, which have now been raised to 12 MP. The front camera is of 5MP with retinal flash. The only feature that IPhone 6S lags is the presence of Optical Image Stabilization which was present in IPhone 6 plus. In comparison to this Apple has come up with a 16 MP camera, which is much quicker than its predecessors. The phone tends to possess impressive manual mode, which is one feature that the Apple has to incorporate yet in its range of smartphones. One cannot choose one phone over the other in terms of camera, as Apple has the best camera for pointing and shooting while the Samsung has a fantastic Manual mode. Software: This is one area where the Apple’s dominance can clearly be felt. The basic Android Lollipop 5.1 was a huge success; however, the Samsung’s modification in the existing Android has brought it on the back seat. Apple has not changed much from its primary IOS operating system, and IOS 9 is clearly a modification of IOS 8. However, IOS 9 is clearly faster than the Samsung’s Touch wiz. The App store is also vibrant and has quality content as compared to Google Play Store. Samsung has tried to take on Apple with its S-voice, which is capable of doing tasks such as updating your memo as well as calling people in your contact list. Apart from this you, of course, have a Google now which is being upgraded to ‘Google Now Tap’. WE would rather say that this Google’s assistant is a major competition to Siri as compared to S Voice. But not being far behind Apple has also come up with some improvements in its Siri. Siri voice element has become more efficient while the search results from third parties can also be displayed. If we compare IPhone 6s with the Samsung S6 result pretty much come even, or let’s say are partially inclined towards Samsung S6. Apple has rolled out several improvements in the design of the device and its camera quality (where of course Samsung has its own strengths). 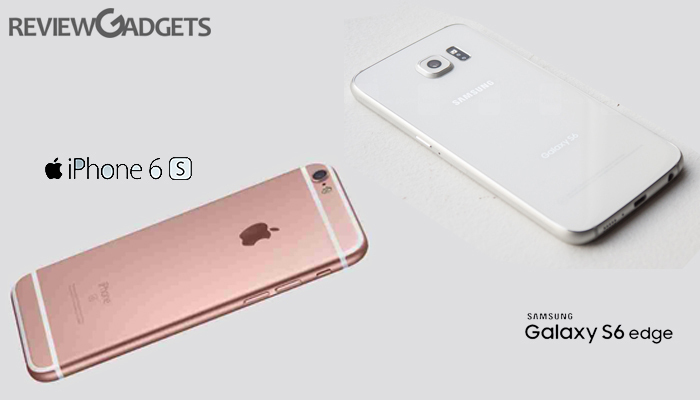 The performance provided by the IPhone 6s is on the higher end as compared to Samsung S6. The heavy weight of Android with Touch wiz is what is weighing the phone down. However, one of the new technologies that we encountered is the 3-D touch. This technology has made the device even easier to use and can be hugely influential in the future of smartphones. This time, our balancing beam inclines more towards Apple then Samsung S6. However, that doesn’t mean that you cannot go for Samsung S6-this phone has its own strengths and benefits. OnePlus Two VS Yu Yutopia Review – Which Is Better and Why?